A quick overview of some Quick Search options. 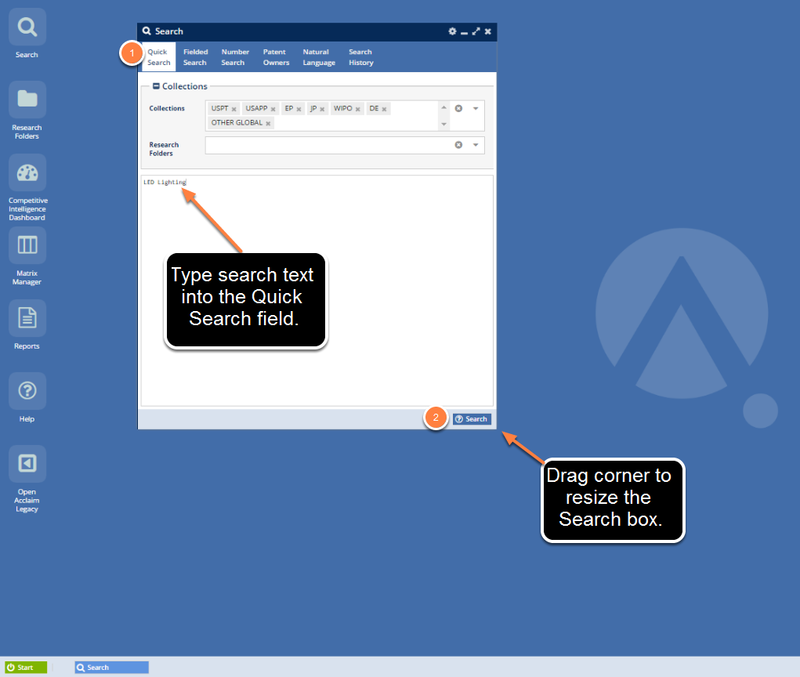 The Quick Search tab (1) is where you'll begin many of your searches. Just type in some text and click Search (2). If you type in multiple terms, AcclaimIP assumes a Boolean AND between the terms. Your search is therefore narrowed by requiring both terms to exist in the document. AcclaimIP has over 70 different field codes you can use to query the patent data. In the example above, the field code is ANC, which is the code for "Assignee Name Current." This is a field that contains the most recent registered owner of the patent in normalized form. By contrast, ANO is the field code for the "Assignee Name Original" which is the entity that originally owned the patent. This entity may or may not be the same entity as the ANC. Notice the colon ( : ) after the field code. This is the delineator that AcclaimIP uses between the field code and the data you are searching (the value). AcclaimIP also supports the forward slash delineator (which is used at the USPTO website). In other words, ANC/Philips will return the same results as ANC:Philips, but the / has been deprecated in favor of the more modern and standardized colon delineator. AcclaimIP has far more searchable field codes than the USPTO website does, so any query from the USPTO.gov site will work in AcclaimIP, but not the other way around. AcclaimIP's syntax structure is similar to Google's. For example, "site:www.acclaimip.com expiration date" (no quotes) will search for the terms "expiration" and "date" on the AcclaimIP website. A string is a series or words strung together. 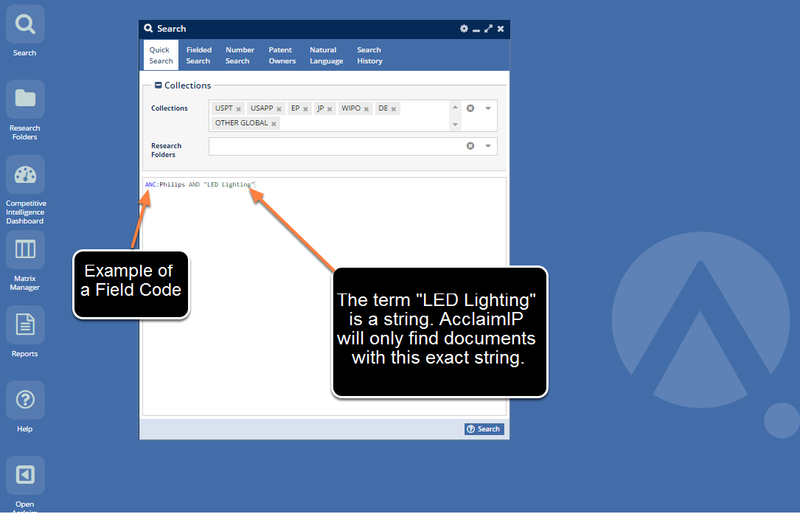 For instance, type "LED Lighting" (including the quotes) into the Quick Search field and you'll find patents that contain this exact string. AcclaimIP won't return patents containing the term string "LED-Based Lighting," since the term "based" appears in the middle of the string. "LED Lighting" (without any quotes) searches for documents that contain both the term "LED" AND the term "Lighting"
"Handheld Device" AND antenna --> Finds patents with the string "Handheld Device" AND the word "antenna" anywhere in the document. ABST:("Handheld Device" AND antenna) --> Finds patents with the string "Handheld Device" AND the word "antenna" in the abstract field. TTL:"light emitting diode" AND "conductive substrate" --> Finds patents with the string "light emitting diode" in the title and "conductive substrate" in the default field set. Why: To find both strings in the title field, you need to use parentheses around the entire set of terms you want to search (see the next example). TTL:("light emitting diode" AND "conductive substrate") --> Finds patents with the string "light emitting diode" and "conductive substrate" in the title field. To view the Field Codes available to you, click the Help icon on the AcclaimIP desktop. You'll notice a series of tabs at top which includes Syntax Instructions, Cheat Sheet, and Column Definitions. A handy PDF of the Cheat Sheet can be downloaded by clicking the Download PDF button in the bottom of the Help window's toolbar. 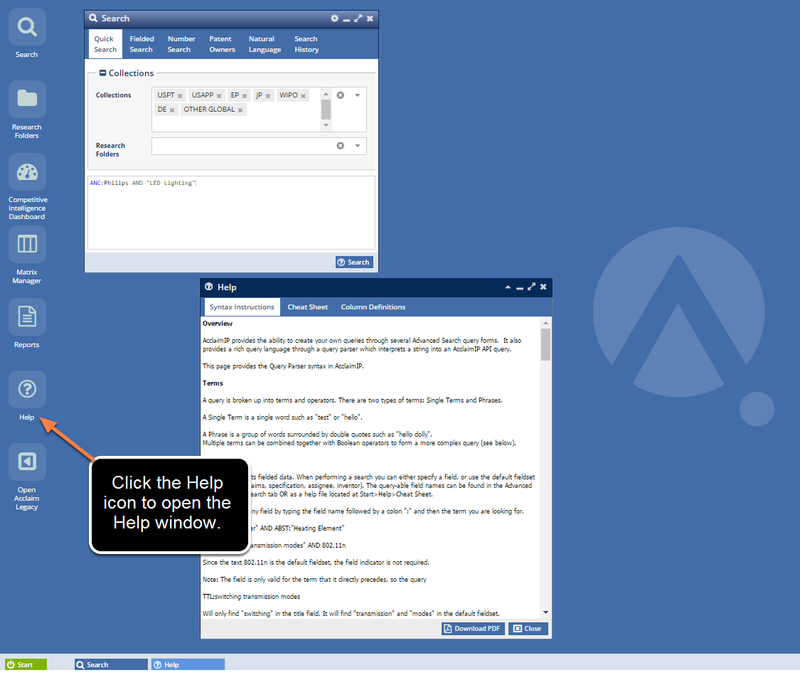 To view the syntax instructions, click the Help icon on the AcclaimIP desktop and then click the Syntax Instructions tab. 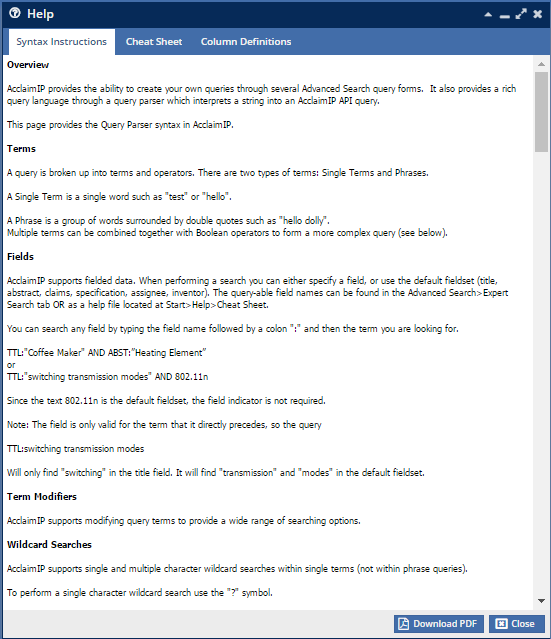 The document shows you how to use the advanced syntax and special features, including proximity, fuzzy, and range searches.